I've been working with this particular camera for a while now and I'm writing this article to share some information that I've discovered along the way. Scope of this article: The EyeSpy247 F+ is an older (superseded) camera manufactured by Sercomm. 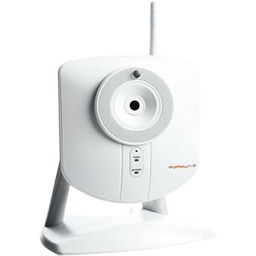 The same camera has been sold under other brands and there are other contemporary models such as the EyeSpy PTZ which share features and interface. If the camera is new or you have done a factory reset (the little hole that you push a straightened paperclip into) then it won't have your wireless details and therefore can't connect wirelessly. You will need to connect it to your network with a cable in order to set up those details. Use an ethernet cable to connect it to your router and power it up. All LEDs should come on briefly and then some flashing lights for a while. Give it a minute before trying to find it on your network. I have found this stage to be problematic if the camera has wireless details which are out of date. So if you've bought the camera secondhand or if your network has changed, it might be worth doing a factory reset before trying the above. Once you've found the IP of your camera, type that into your browser to see the administrator screen. You should be able to view the video from the camera and access its settings. You'll need to give the admin username and password - by default this is 'administrator' and leave password blank. You might like to change this at some point. Go to Setup > Wireless. If you don't know your router's security method, you can check this within its admin screen. It seems that newer routers use WPA / WPA2 but I've had routers that have used WEP. You may also be able to copy and paste your router's SSID from the same screen; this is the name that your network is known as under your computer's Airport menu. By default something like BTHub4-3XYZ. (You can leave this on 'Any' but I think things will work better if you give it the name). If you're using WPA/WPA2, there's just a single box for your key - easy. If WEP (this confused me for a while) - Authentication type: Open system, WEP Encryption: 64-bit keys, clear 'Passphrase' and the WEP key fields. Enter your 10-digit key in the 'Key 1' box and save. I like to give my cameras fixed IP addresses. This saves having to search for them again if anything is switched off and on. Go to Setup > Network, click 'Use the following IP address', pick an IP address (maybe the one that the router has already given it), enter it and save. With all of this set up correctly, you should be able to disconnect your camera from the power and from the network, wait a few seconds, plug the power back in without the network cable and wait another minute or two. If all's well, you should then be able to type the camera's IP into your browser and see video. Note that the button above the camera's lens which lights up when pressed is the privacy button. If this button is lit then you won't get video or sound. You can disable this button if you like, or disable the other LEDs from the camera's admin interface. Tentative steps towards full automation? Often wondered about getting one of these, and setting up the networking is always the tricky bit. Your utility looks pretty cool.